Narrative content used to be a de-facto part of a painting. From biblical scenes to Ukiyo-e in Japan, even back to mammoth hunts on cave walls. Stanley Spencer, moments of moral tension in Victorian art, glimpses of sensual frivolity in France and everyday life in Holland. All these to some degree have narrative content at their core. Narrative content has fallen from fashion though. Even from the time of Claude Lorraine and later Turner you can see the narrative content withering. With the Impressionists it is there with the cafe scenes, but gone in many of the landscapes. It has had a longer life in the niche of surrealism, naive and mystical painting. Illustration of course nearly always narrative in intent. The modern fad for formalism has mostly washed away desire to tell a story from the admissible ambitions of today’s painters. It is the the painting itself rather than any story it might tell that is the important factor to artists. This is of course not true of the viewers of paintings, who still love a story. It is just that artists feel that they are above such menial tasks and serve a higher and more elevated muse. The result of this conundrum is a little perplexing, the fine art world is awash with artists who want to address important, serious and relevant issues, but are alas denied by fashion most of the tools by which they might do so. To have any chance of smuggling narrative work into the fine art arena you must have a quirk such as painting your cartoons on walls as Banksy does, being an international man of mystery helps too. Hogarth could comment on social issues in a direct manner in his work, but today’s painters do not have that option if they want to be accepted into the gated community of the contemporary art establishment. Some, like Paula Rego, sneak in under the cover of magical realism, but mostly the doors are firmly barred. This subject was partly brought top mind by the reviews of Sorolla at the National Gallery. The reviewers only seemed to be able to comment on the content. They did not seem to see the abstract qualities of the paintings, they could not get past the narrative. Which shows I suppose how powerful an element it is. So what is narrative and how do we exploit it? Like all the ingredients that can make up a picture we can add more or less to taste, or indeed none at all. The smallest doses of narrative are signs of past activity or impending activity, either natural or human. So the hay bales in a field tell us of activity even though the farmer is not in view. A war painting might show destruction but no soldiers, merely the aftermath. The purple threatening clouds might hint at an oncoming storm. The unifying ingredient here is the passage of time, we are alluding to time before and after the moment in the painting. To the other extreme we might have a comic strip where the whole image is narrative driven with the flow of time and even words and thoughts are included. The Sistine ceiling is another example of dominant narrative. All the other elements of painting are there, but their purpose is to serve the narrative. So if your landscape painting has a dog walker it is quite different in mood to one where the scene is empty. The viewer’s eye will home in on the figure. If it is a figure on a wild moor we will ascribe loneliness, isolation or some other poetic notion. If we have two figures apart we might ascribe emotional separation too. If close then companionship, if arm in arm perhaps love. A group of three might indicate family. When we see isolated figures we cannot help but to attempt to decode social clues. Interestingly if we have a crowd or a group of five or so then that reduces the narrative draw. If in a painting in a city square you have groups of inhabitants then the eye will be drawn to any single figures. Any people in groups are assessed as composite beings not necessarily individuals. If we bring our group forward and make the painting about them the a whole other set of narrative considerations come in to play. We immediately set too and try and assess the relationships between them. If we have a single figure and slowly enlarge or refine it the composition, then at a certain point we attempt to determine the emotional state. There used to be manuals for artists about how to paint different emotions, which to our eyes look comically theatrical. If the figure has no clear emotion then it can attract more consideration than if overtly weeping or laughing. This is simply because the viewer has to work harder and is therefore more deeply engaged. So narrative elements are powerful tools and not easy to use. They also are very prone to the whims of fashion. We find Victorian morality paintings heavy handed and crass, but at the time they were thought to be the bee’s knees. Care must be taken when adding incidental figures, you quite often see urban scenes where all the figures are individual, each a separate observation. Oddly this nearly always detracts from the unity of the overall scene, or gives the the feeling of a montage. I have seen crowd paintings where all the figures look like the moment just before the zombies in Thriller begin to dance! I am so behind with blogging that this was last year! This was a whistle stop visit to Arundel. I was very rushed so didn’t do the place justice. I will return as it has some fascinating things to paint. 12in by 6in Watercolour. 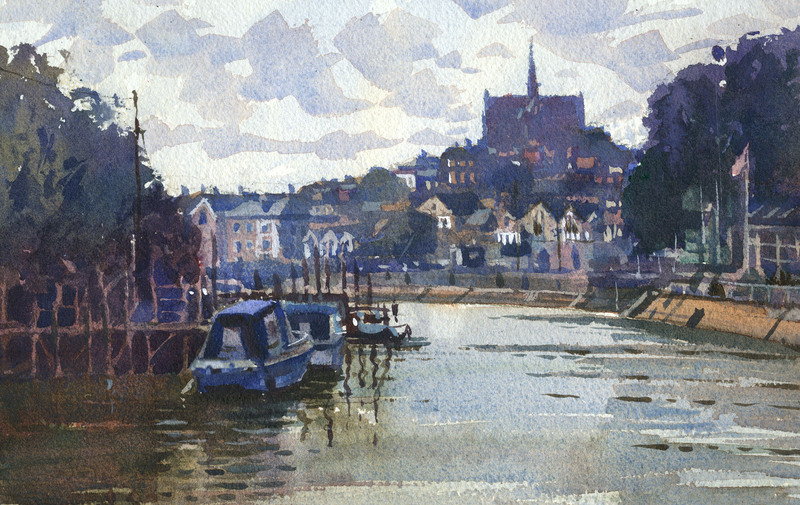 I took a bit longer over this but still only about 30min before I had to leave Arundel behind. 12in by 7.5in Watercolour. 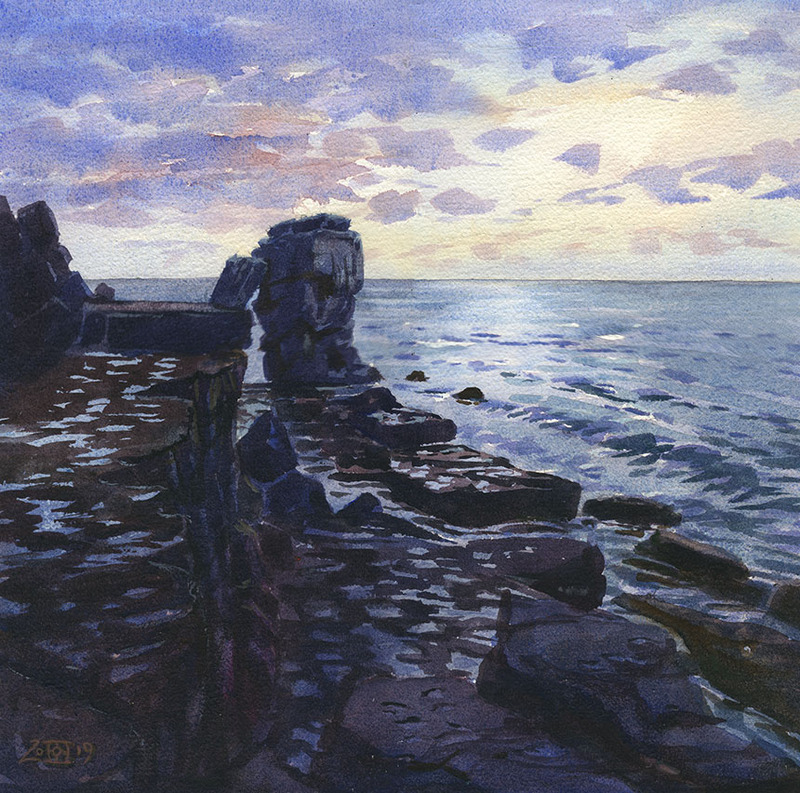 This is Pulpit Rock on Portland Bill, a studio painting which I did entirely with a 1in sable flat. More of an experiment than a finished work but fun to do. I notice by the date I have ignored the watercolours for nearly 8 months. 12in by 12in Watercolour. This is a great view of Hambledon Hill from Bedchester. I really must do it in better light but have been unlucky so far. the scene is good in any light but that just means it would be better still on another day. 12in by 6in Watercolour. This is another scene that has been frustrating me, but this time I was there at just the right moment. 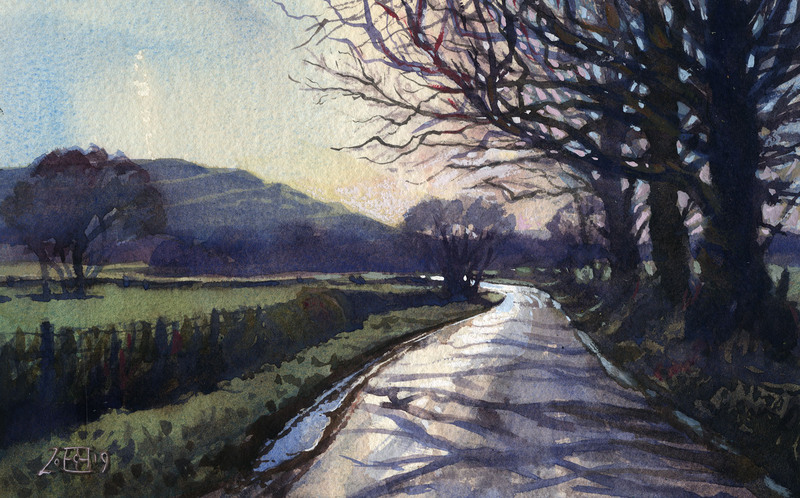 Slightly tricky as to make a decent composition you have to move Hambledon Hill about 300m West. No one complained as I put it back once I was done. Here the challenge was to get the brilliant winter light. To this end everything had to be made subservient to the reflected light in the road. 10in by 7in Watercolour. 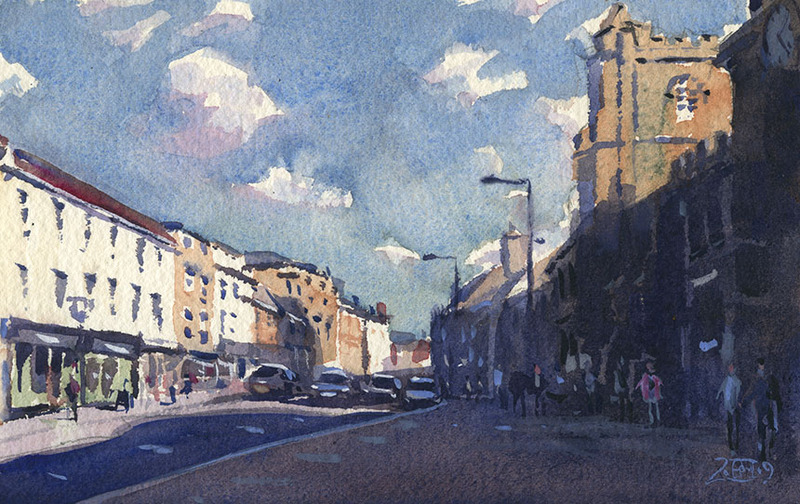 A quick impression of Shaftesbury, didn’t want to get into too much detail as the shadow was the main event. Painted all with a flat brush again. No time to preserve all the lights so a few touches of opaque paint to annoy the purists! 8in by 6in Watercolour. This is the River Stour from the bridge at Blandford. The willow has wonderful colour this time of year. Not perfect light as I was a bit late, I must manage to catch it in perfect light. Unfortunately the bridge is too narrow for plein air, I am happy to suffer for my art, but dying is going to far! 14in by 7in watercolour. Snow! 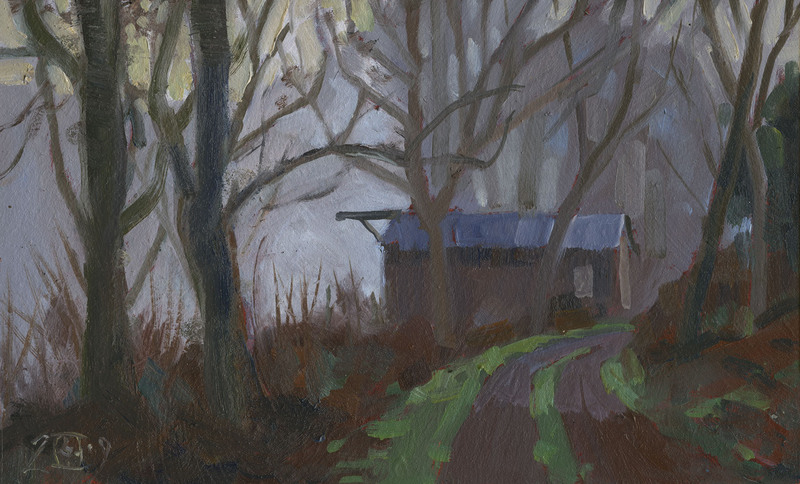 On the day I stuck to the oils but I had so many atmospheric snaps taken as we drove around I could not resist a couple of studio efforts. The studio is great for this sort of painting as you can leave the washes to dry and preserve all your lights. This is near Bulbarrow. 14in by 7in. Last one this is the road as it drops off Bulbarrow. The snow bounces the light around and makes some wonderful contrasts. I thought this was a good image to show what adding a narrative element does. 12in by 6in Watercolour. So if you hung these two versions side by side which would get commented on? Does the fact that the Rhino would draw attention make this a better painting? Or does the Rhino get in the way of appreciating the mood of the scene? Not questions I have answers to, but they are questions a painter needs to consider and it shows just how powerful narrative elements are. Memory seems a simple thing. Something happens to you, it gets encoded in your brain and there it is like an entry into a diary. There is short term memory which is like taking a quick note that you bin after it has served its purpose, and longterm which is like your archive. For an artist both are important because you need short term to transfer the information from eye to canvas and long term to learn your craft. However memory is not much like how I have described above. Which in turn makes what we do as artists less simple than it might at first glance appear. Both long term and short term memories are effected by our hopes, expectations, preconceptions and desires which in turn colours or filters the information being recorded. This is shown by how witnesses remember the same events quite differently. It also goes some way to explain why those photos of the scene look different to how you recall the moment at which the snap was taken. We blame the camera, but it is our method of making memories that is I think the more likelyl cause. So there we are on a clifftop preparing to paint, what could be going on? Firstly you perhaps need to consider context. You have gone out seeking a subject and inevitably you have high hopes in that regard. The brain is forever applying rose tinted glasses to your perceptions: That person you are having dinner with appears more and more attractive. The painting you are working on seems better and better… or the reverse of course if we are depressive! So the scene you see is not only what is there, but a romanticised version of it overlaid by hopes. In practice what happens is that if you seek colours in the shadows then you will see them. You photo will later show that they are actually just dull grey and you might exclaim that the camera is so poor compared to the eye. This however is unlikely to be the case. What is more likely to be happening in many instances is that the colours are invented by our internal image processing and not really present. In a different mood we might produce an alternate set of hues from the same scene. it is also possible that the colours are there in a subdued version which our visual system grabs and gives added zip to. If we really painted what was actually before us our pictures would mostly be as disappointing as those photos can be once we have them home. We have to accept that what we imagine to be realism is in large part a fantasy, shaded in with the coloured crayons of our imaginations. I myself think this is a wonderful thing. It means you are free to imagine whatever you wish from the promptings that your eyes are transmitting. It also means that someone who views your painting of Portland with the lime green sky will be perfectly happy with it as their visual system is similar to your own. Like most things once you have a better understanding of how you are doing a thing it allows you to exploit what might at first appear to be weaknesses and transform them into advantages and strengths. So a few more delusions of my own distorted reality. I have set about doing some larger studio pictures, this monster is 48in by 30in. 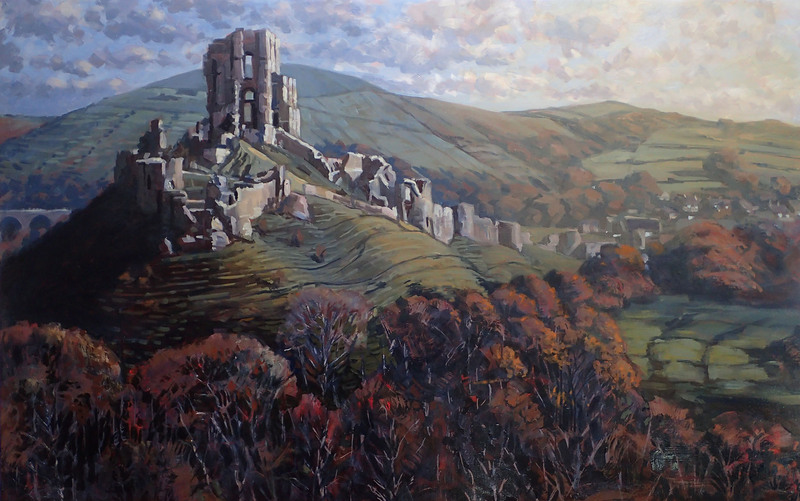 After a day painting in Corfe I was, as described above, disappointed by the resulting photographs next day. As I came down West Hill I had thought how wonderfully romantic the castle looked and taken photos at regular intervals as I descended. 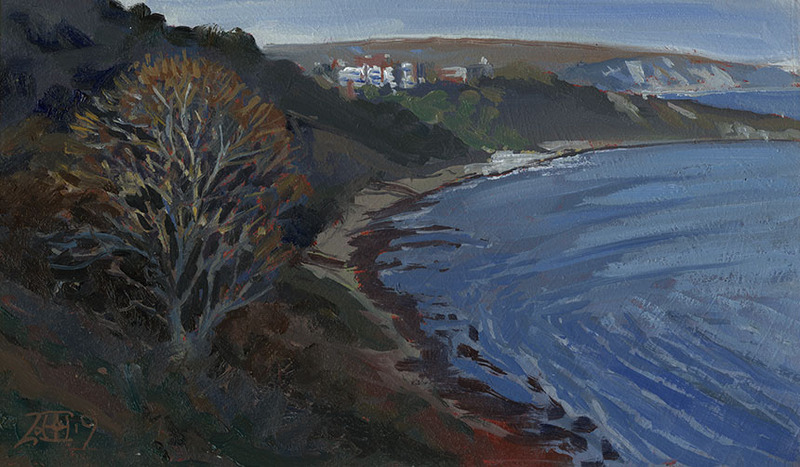 Despite the lacklustre reference I set to and the block in flew off the brush, so I was optimistic for the next day. It did not go well, the reference took control and the painting went down hill. In the end I allowed my first impulse about how romantic the place was in an 18C way to take over and painted quite a different painting than the one I had originally intended. On reflection the above is probably closer to how I felt when actually there than my original plan. Oils. A day out at Fontmell Gifford in Wiltshire. I expected a sunlit lake but all that was there was fog and an invisible lake! Still this was fun to paint with lots of subtle greys to enjoy. 10in by 7.5in Oils. After a hearty breakfast nearby the lake had appeared! I have been enjoying this wide format of three squares. This might be fiddled with yet, I have perhaps over darkens the foreground by a notch. I’ll leave it like this for now though. 24in by 8ins Oils. Last one of the day. This is Castle Rings near Shaftesbury. It is such a magical place but very hard to catch the feel of the place. I think the wider format might have been better, but I had used my only wide board. Also I think I could have allowed my inner Tolkien to have taken over and pushed the fantastical feeling that the place has. I shall return with that in mind! 14in by 10in Oils. 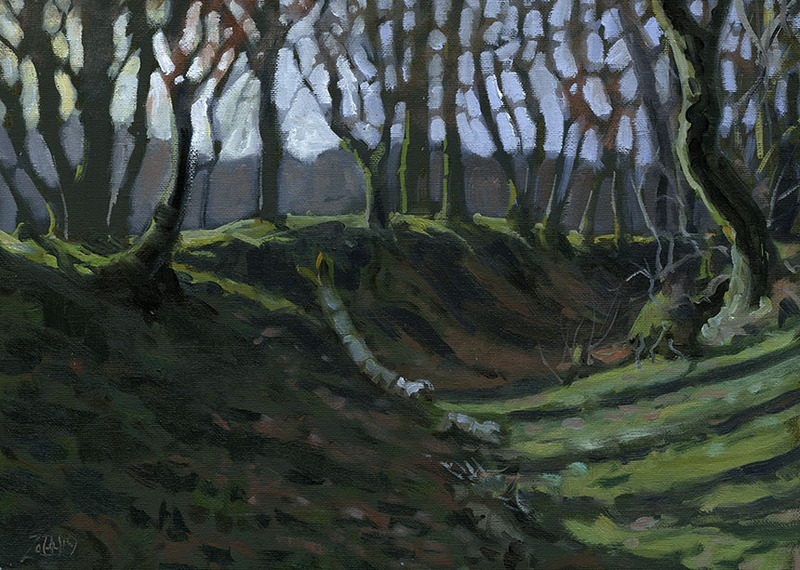 Here is one of Anvil Point where the scene was so immediate that I just had to have a go. I did manage to rein myself in enough to think properly about what how I would approach it. 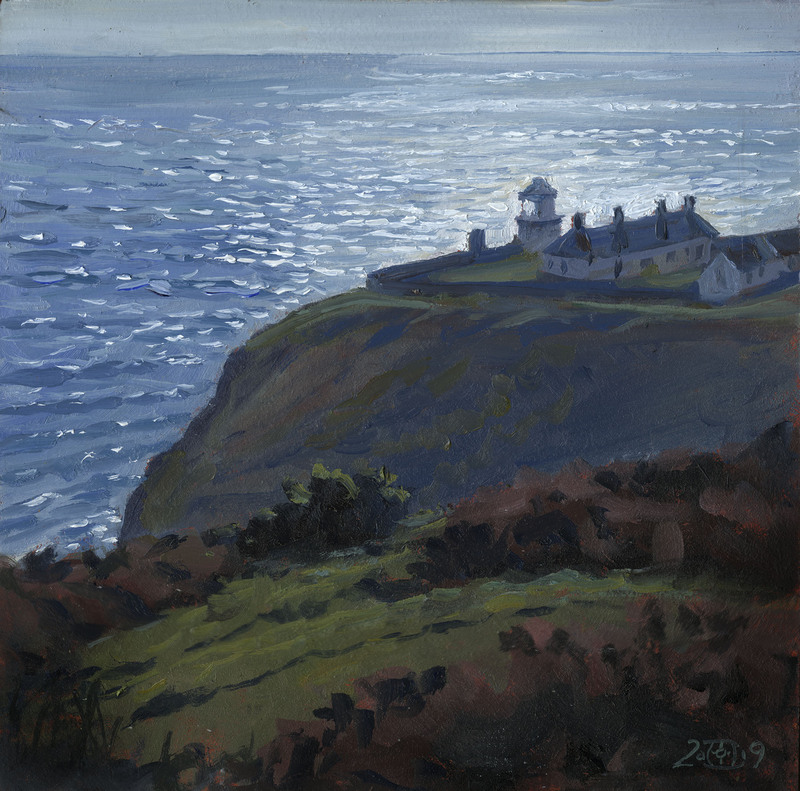 The tone layer with the lighthouse was absolutely key. Too dark and the foreground would not separate, too light and there would be no “dazzle” to the sea. I did three experimental patches first to get these three areas named down. Just as well I did as it took 4 or 5 goes to find the best balance. A problem you will always face is that your mind’s eye sees further into the shadows than you want. It was very tempting to add a yet lighter tone to the foreground but I stuck to my guns and resisted the devil on my shoulder. I had to refine the sea and lighthouse later as the wind was so fierce that no finesse was possible! 10in by 10in Oils. Last of a very fine day This is looking towards Swanage from Durleston Castle. The light was going over very quickly, but as is often the case that added magic to the scene. I had to paint this very rapidly as a consequence. 12in by 7in Oils.